At some point in the not-to-distant future (starting in less than four years), the idling generators on refrigerated trailers will be severely restricted. First, by the state of California who has proposed a phased in approach to curb the stationary idling and its associated noise and emissions. Within the next decade, reefers will transition to alternative technology including hybrid electric. 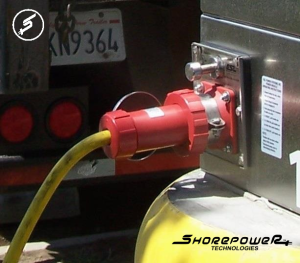 Shorepower’s turnkey infrastructure for reefers is now helping warehouses and distribution centers save 40% to 70% on diesel fuel and comply with these new laws. Plus we have options for drive away prevention. The Department of Transportation should be considerate and responsible to the Truckers and Trucking Industry, in requiring most cities across America, to offer Reefer Parking lots. Only Reefer drivers will be required to go and park their Reefer, or company Reefer at these giant Reefer Parking lots. The Reefer driver then could get assigned a Parking Space, a Kingpin lock for the Reefer, and locks for the two back doors to the Reefers. The Reefer driver could then disconnect from the Reefer and Bobtail to a legal parking area or space and have Shorepower available onsite. The Reefer driver could have the option to park onsite, in a separate parking lot for Reefer Bobtails, or leave and park legally elsewhere. Upon leaving the Reefer Parking lots, with the load, the security guard will check out, making sure Kingpin lock and rear door locks are returned, or charged to the driver or Logistics company or trucking company. This would help reduce driver fatigue, so the Reefer driver could get a good nights rest and free up Truck stops across America, from unnecessary, pulsating Reefer engine noise. It would give everyone at a truck stop, more spaces and the relief to know they don’t have to endure the penetrating, pulsating sound of a Reefer Engine, while they are on their rest break.